This beautifully appointed self catering holiday cottage is situated in the heart of Burnsall in Wharfedale, one of the prettiest dales in the Yorkshire Dales, overlooking the village green and river with uninterrupted views to the rear across fields which rise to Burnsall Fell. Our self catering luxury holiday cottages offer comfortable accommodation to suit all the family. The Yorkshire Dales Holiday Cottages have gone on to achieve a four star rating from the Quality in Tourism organisation numerous times and we try to maintain our high standards for your enjoyment in . Grassington and are both ideal centres from which to explore the Yorkshire Dales and our self catering holiday cottages provide you with home from home comforts. Our Yorkshire Dales Holiday Cottages in Burnsall and in Grassington are both situated on The Dales Way which run all the way from Ilkley in West Yorkshire to the famous Lake Windemere running through Wharfedale in the Yorkshire Dales National Park which provides a lovely day out. The route takes you over the moors, through the valleys and near numerous rivers and is the best way to enjoy and view for yourself the wonderful Yorkshire Dales and . 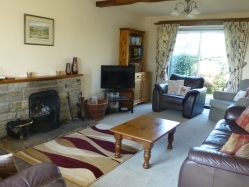 For Yorkshire Dales Holiday Cottages in the area contact us today on 01756 752435.